These are really for breakfast? Indeed, they are! There are fresh blueberries that are blended into the pancake batter and a low sugar blueberry jam that I used as the syrup. 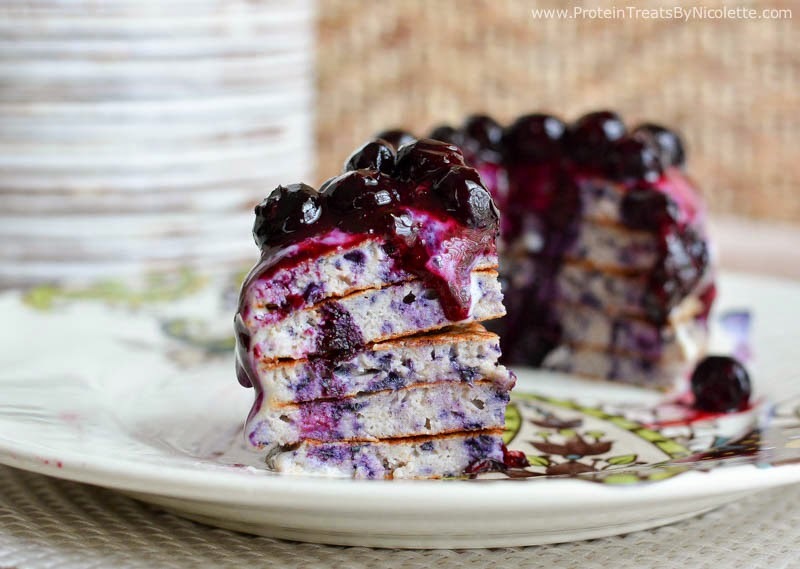 Blueberry galore :) They will start your day off right with a whopping 38g protein and only 13g sugar in the entire dish! Compare that to IHOP's strawberry pancakes that has only 18g protein and 27g of sugar - I think we know the winner here. Enjoy! 1. Heat a skillet on the stovetop over medium heat. 2. In a blender or food processor, blend together egg whites, ¼ cup almond milk, ¼ cup blueberries and cashew butter until smooth. Pour into a mixing bowl. 3. Add ½ scoop protein powder and oat flour to the mixing bowl and whisk until smooth. 4. Spoon about ¼ cup of the pancake mix onto the skillet, making 5 pancakes total, and cook on each side about 2-3 minutes or until golden brown. 5. For the jam, heat ¾ cup blueberries and maple syrup in a saucepan over medium heat, stirring occasionally, for about 8 minutes. 6. For the glaze, stir together ¼ scoop protein powder and 2 tablespoons almond milk until smooth. 7. Spoon the jam and glaze on top of the pancakes. Enjoy! 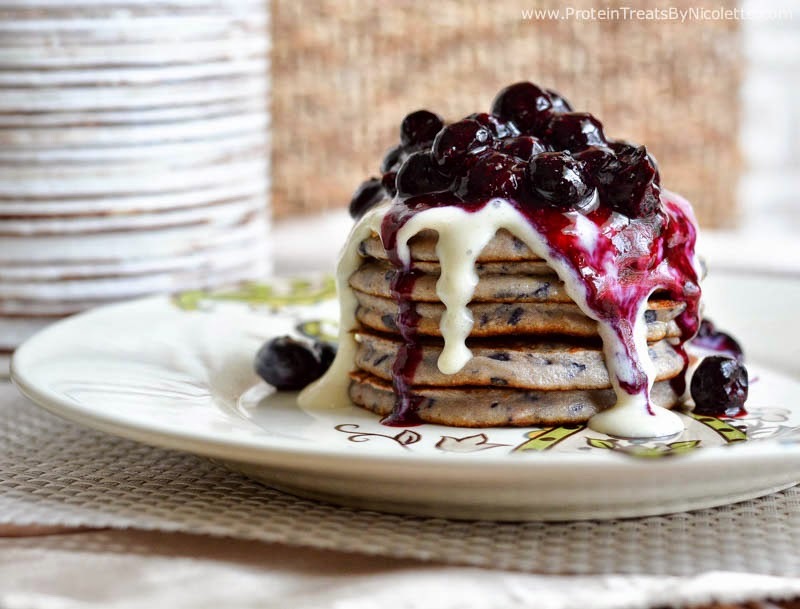 You definitely have got me craving a stack of pancakes right now. 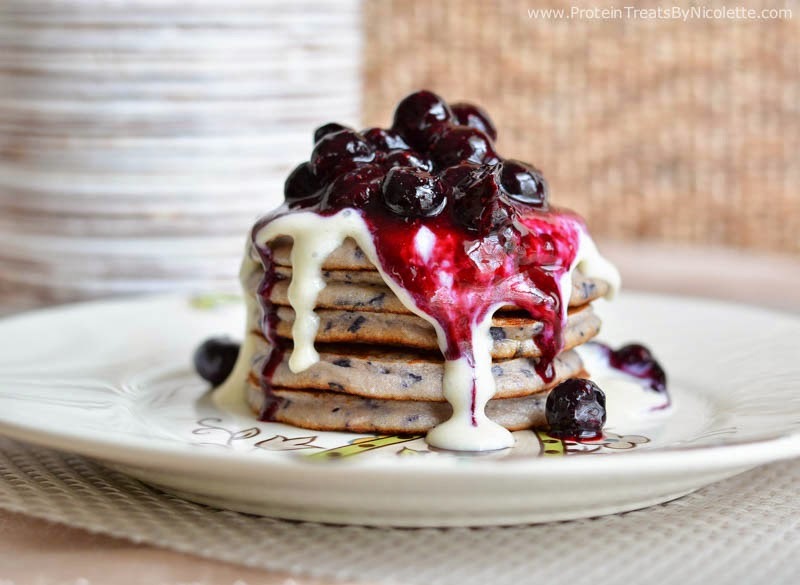 These look pretty awesome & surprisingly healthy too! i read the recipe wrong and added 1/2 cup of protein powder to the pancake mix (lol) but they were still really good!!! Thanks for the recipe! Oh no! haha! You got an extra dose of protein :) Glad you still enjoyed them! Is the recipe for one serving? Could you make these on a waffle iron? I am not entirely sure - I think it depends on the waffle maker. If you are able to use different mixes in your waffle maker, I don't see why it wouldn't work. I made this recipe exactly as written and my pancakes did not turn out as thick as depicted in the picture above. It also only yielded 4 pancakes. Is there something I did wrong? When the texture seems a little off from my pictures, I immediately think it is the protein powder. 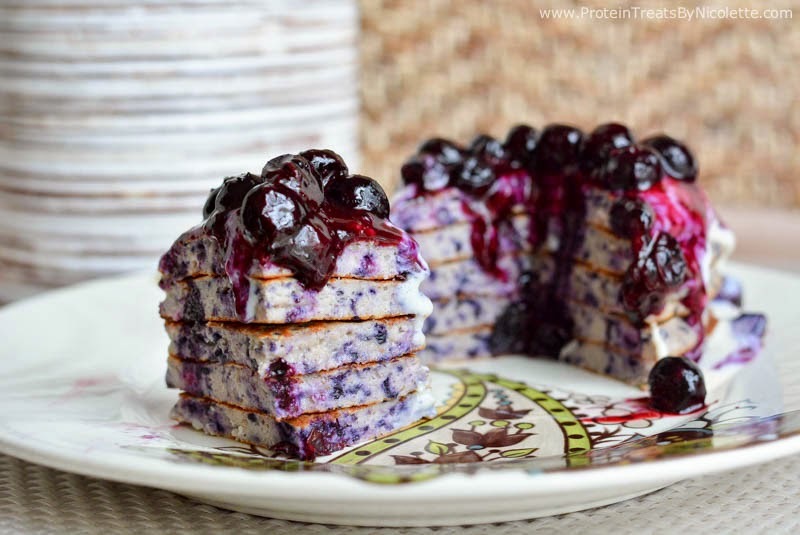 The type of protein powder you use makes a huge different in the texture. 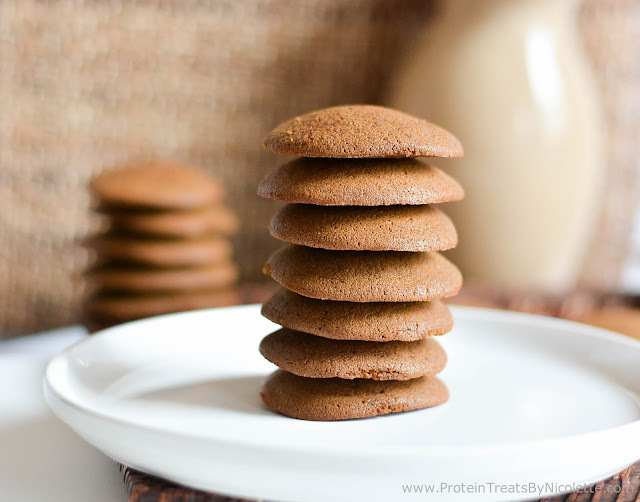 If you want them to be a bit thicker, try to add a little more protein powder or oat flour. How much is 1/2 of one scoop of protein powder via TB because I am using a different whey powder and wanted to make sure my measurements were correct...??? Usually, 1/2 scoop is about 2 tablespoons. Made this today after I saw it on Pinterest. I seriously can't believe how good it is! THANKS!